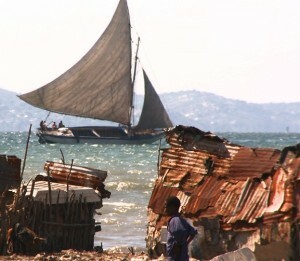 In August of 2011, an earthquake struck the island of Haiti. No ordinary tremor, the quake killed over 200,000 people and as the world watched, Haiti came undone in its wake. Some gave money, some actually went to take a look — returning in disbelief, and a few stayed. ID Vision’s documentary, Haiti Untold, gives us a revealing look at the few who stayed and the resurrection they are bringing about. NHL Player Georges Laraque sees his celebrity as a huge responsibility. He was one of the players that showed up on Haiti’s disheveled doorstep two days after the quake. “You get people to follow you and you can do great things,” he says. Thankfully, directors Depelteau and Shannon were not about to short shrift their Canadian countrymen and women in unfolding the story. Joey Adler, CEO of Diesel Canada, is a committed spokeswoman who knows that “levering relationships” is as essential as raising the funds to do the job. One of her multi-million dollar projects has been a healthcare center in a hard-hit area and she sees it as “a phoenix rising out of the ashes.” It was Adler who convinced fashion mega-star Donna Karan to roll up her sleeves and make the journey to put Haitians back to work. Recognizing the amazing homegrown talents of the victims and convinced that the “preservation of their culture” was all-important, Karan put her own entrepreneurial skills to work. In the documentary, we see women happily rolling up discarded cereal and juice boxes and transforming them into colorful necklaces and purses to sell. With what early profits they make, they can buy the beads, varnish and thread to keep their enterprise alive. Denis O’Brien, Digicel founder and CEO, sees “the best artistic talent in the Caribbean” in Haiti, and shortly after the devastation, came face to face with a profound dilemma. Should they rebuild the skeletal remains of Port-au-Prince’s cathedral or the arts market? Finally, in this battle between spiritual and economic sustenance, the market won out. There had to be hope that the economy would one day return, and with 4,000 to 5,000 people working the arts market, it was a wise choice. Several of the artisans are interviewed in the film, and while not forthcoming about the politics involved, they see a decided change. With French as the spoken language, we are provided with English subtitles, but this is hardly a distraction for the viewer. The human response to disaster and personal loss is a pretty universal one and expressive facial and body gestures provided by local speakers say it all. As a good part of the film is devoted to the opinions of the principal movers and shakers interviewed, the documentary could benefit by even more exposure to the inhabitants themselves and what constitutes a day — or even an hour — in such lives. Local color is provided by drive-by glimpses of the villages, the ramshackle homes and rubble that make up a typical street or hillside, and the occasional idyllic landscape provided by a small fishing port or waving palms on the horizon. But we long for more interaction, if not confrontation, between the residents and the outsiders, however benevolent and concerned they might be. One such encounter, which adds a bit of spice to the film, is when Jeff Dorsey, one of the chief engineers involved in the rebuilding, finds himself a babysitter for a small infant plopped in his lap. The mother laughs derisively when he asks the baby’s name in French — finally he gets “Donaldson.” When he tries to give the baby back, there’s a brief hesitation. “Don’t give us the baby. Give us money.” Even if it’s just a tongue-in-cheek exchange, the message comes across loud and clear. Money is, at least where the camps are concerned, the issue. According to Dorsey, though medications are largely donated, management is always within two months of running out of funds. He feels some visitors may be disappointed by what they see through the short lens, but he believes in “long term” change. Ambitions for rebuilding are never more evident than in Haitian Jacques Pierre’s testament for the town of Jacmel. He remembers what a popular place this picturesque city once was and his eyes are bright for the future’s prospects. Investor Michael Capponi and his company see Jacmel as an early 1800s town that inspired New Orleans and plan to make the town a great tourist hub with their hotel and resort ambitions. Angels come in many forms and there’s no question that there’s a place in the hierarchy of do-gooders for filmmakers like Depelteau and Shannon. Their important documentary, whatever its shortcomings in telling the whole story, will make many of us rethink what’s possible when there’s the will behind it. Haiti Untold had its worldwide premiere on DirecTV on October 3. Video Courtesy of ID Vision.